I actually really love peas. At salad bars, I always ask for them. There’s something dainty and precious about peas. And they’re so green. Actually, there’s a recipe for a zucchini noodle frittata and pea shoot salad manchego in the Inspiralized cookbook, because, well, I just had to work peas in their somehow. When springtime comes around (we are 2 days away!!!! ), I start loading up on peas. 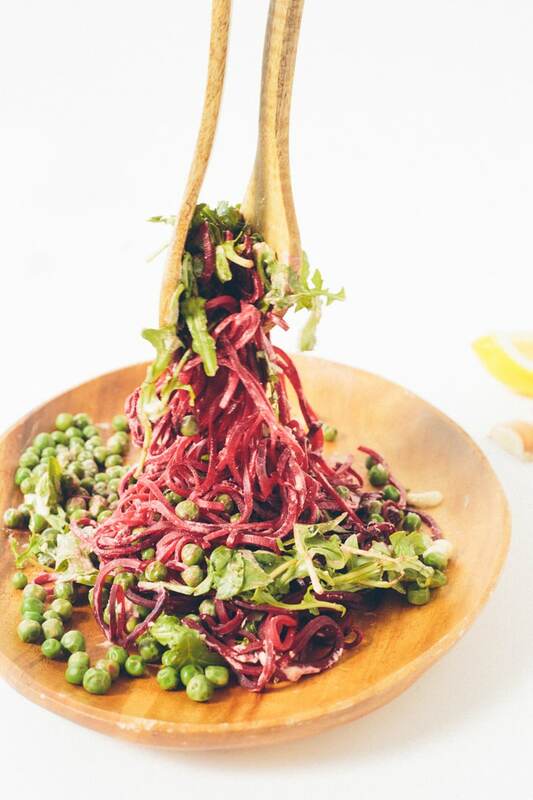 Hence, this beet noodle pea salad. Speaking of spring, does everyone do a spring purge? I always do. I basically re-evaluate my New Year’s resolutions, look at the past 3 months and plan for the summer. I go through my wardrobe and toss everything I no longer need, want or doesn’t fit into big bags and bring them to Goodwill or the clothing drop-off near our apartment. I do a thorough, thorough clean of the apartment with Lu – scrubbing everything. It’s actually the only time of year that I enjoy cleaning. And I really, really, reaaally hate cleaning. Also, I usually start doing away with heavier foods and lighten up my general diet. This is going to be especially helpful, since I have my first wedding dress fitting (ahh!!) on April 18th! I can’t wait. 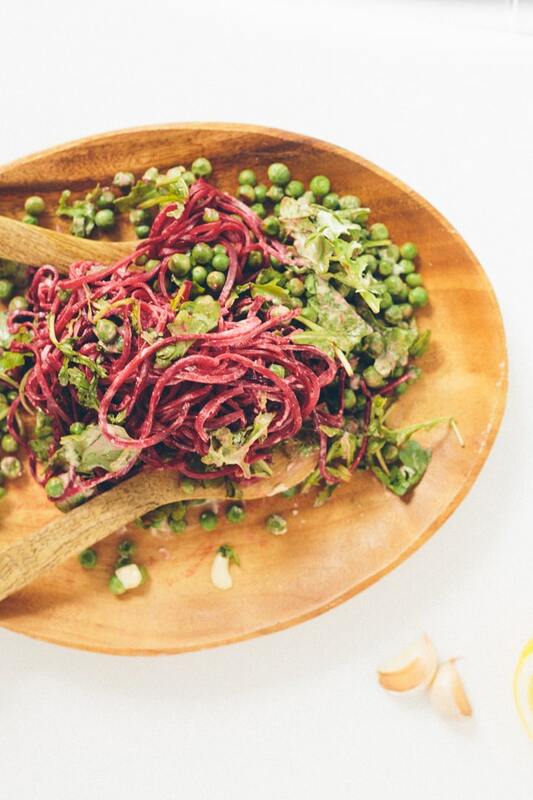 Like… with this beet noodle and pea salad! 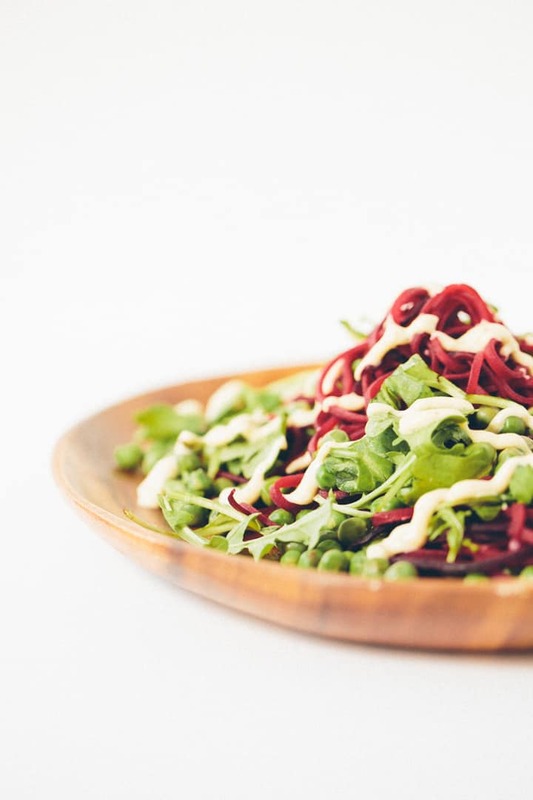 If you’re Paleo, doing Whole 30, or your stomach can’t handle peas, toss in some sunflower seeds or walnuts – or, leave out the peas altogether and just triple up on the arugula. 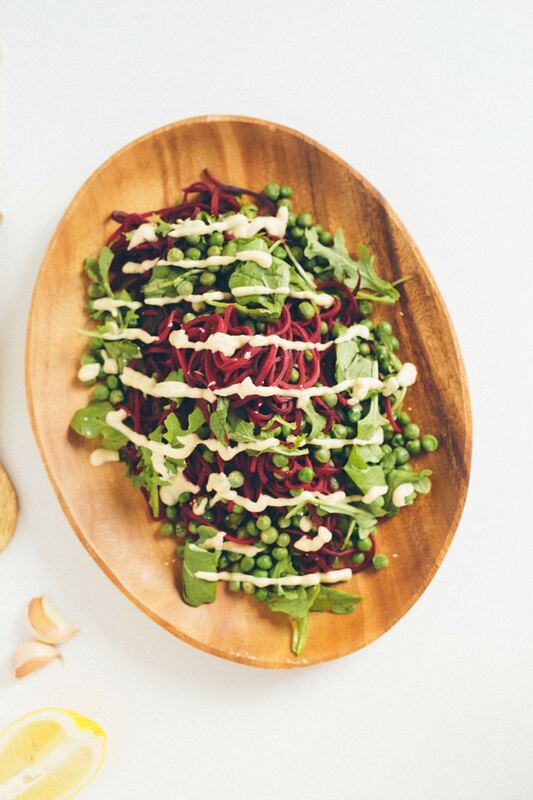 Either way, you’re going to love this salad – the lemon-garlic tahini sauce is what pulls everything together. It’s so fresh, light and flavorful. 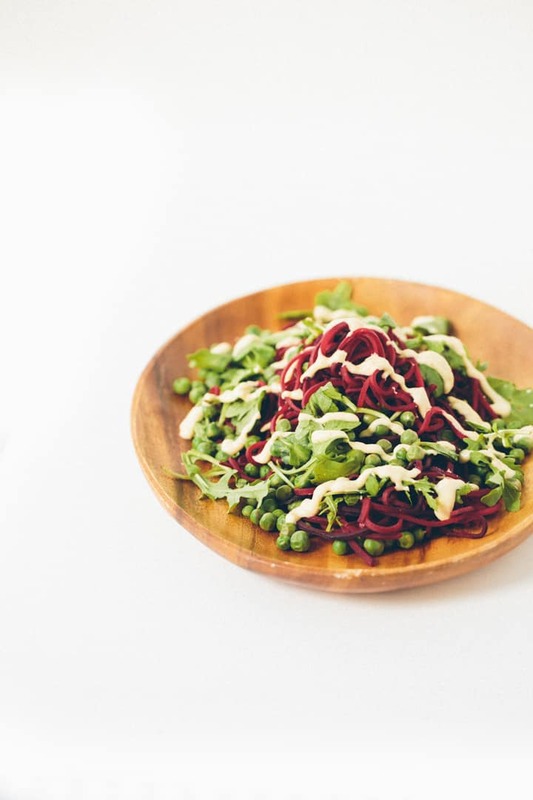 It even keeps well – so this entire salad can be made ahead of time and refrigerated for a week of healthy meals – try topping it with steak, chickpeas or even toss it with a cup of quinoa. Actually, a reader gave me a great idea to start posting up my various dressing and sauces. I’ve put this in my Evernote to do list and Meaghan will definitely be helping me with that one! 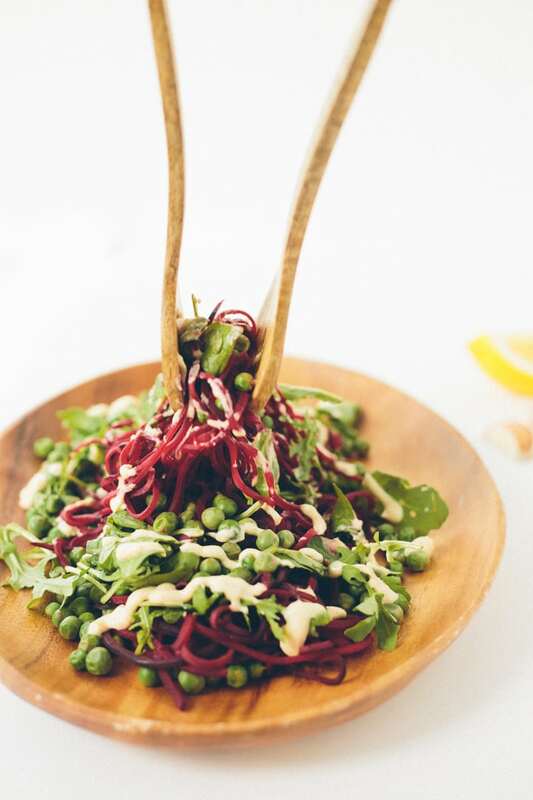 I love the idea – so many of my dressings (like my greek yogurt balsamic) can be reused for different spiralized meals. So, consider it done! Are you ready for spring? Do you have any spring goals? 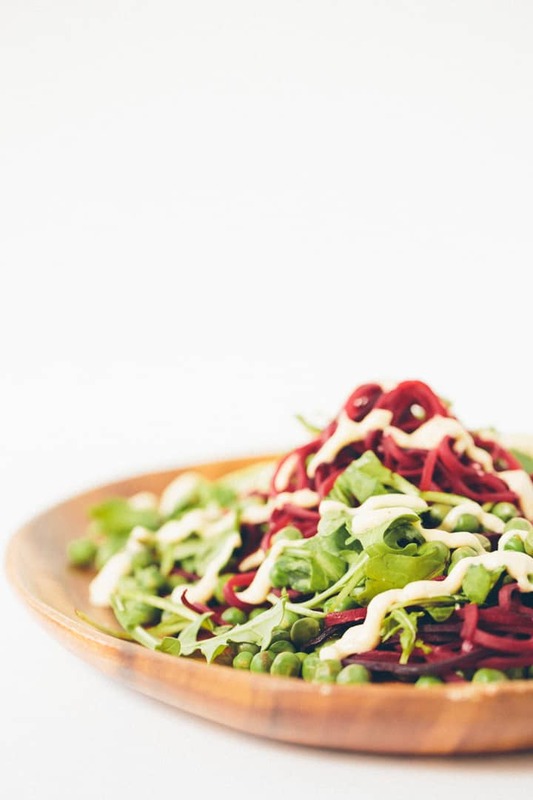 Whisk together all of the ingredients – except for the water - in a medium bowl or pulse in a food processor until creamy. Add water as needed to make creamy. Taste and adjust to your preference. Line a baking sheet with parchment paper and lay out the beet noodles. Drizzle with the olive oil and toss together to coat. Season with salt and pepper and roast for 10 minutes or until softened. 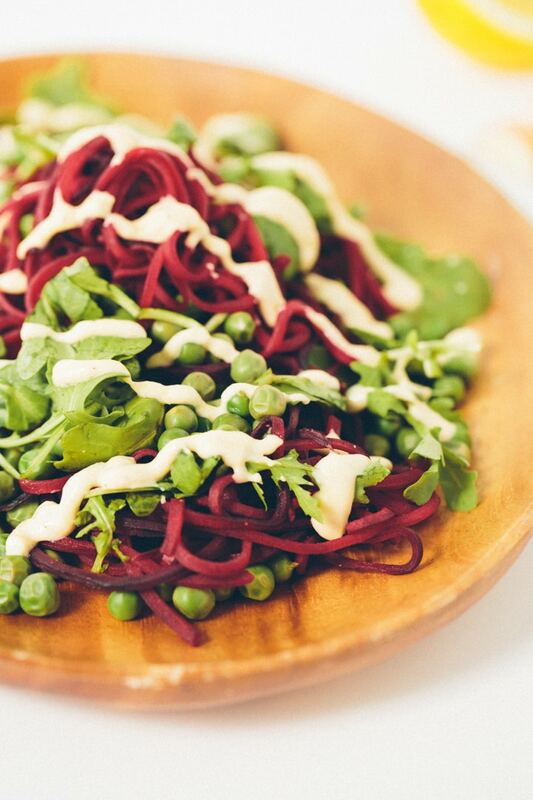 In a bowl, toss together the beets and peas. 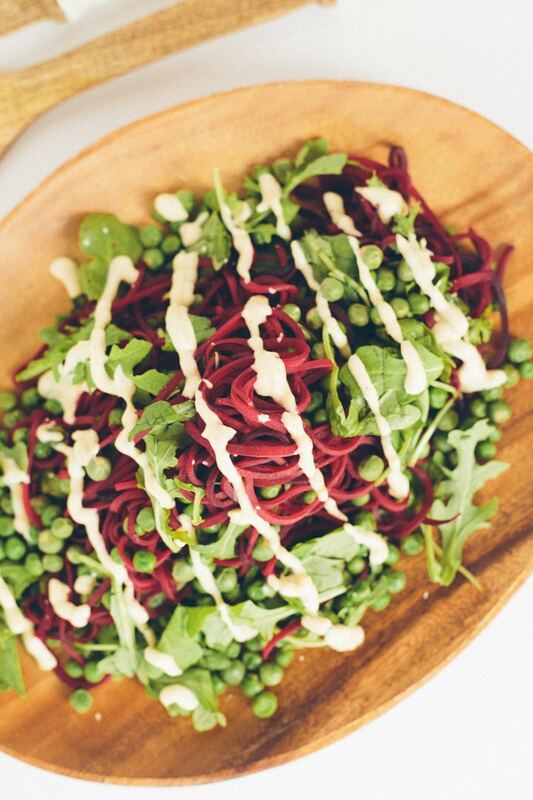 Transfer to a serving bowl or plate and drizzle with lemon-tahini sauce. Optional: serve atop a bed of greens. Serve with extra sauce. Yes, such a great idea to log your dressing recipes separate! I'm already doing this on My Fitness Pal, then I just tick the dressing and then add the spiralized veg/fruit I'm using at that time! Same with the sauces/marinades, then I can add chicken, pork , fish etc. separately . Recipe looks delish (as always), I be trying it soon. Yayyyy roll on SPRING! 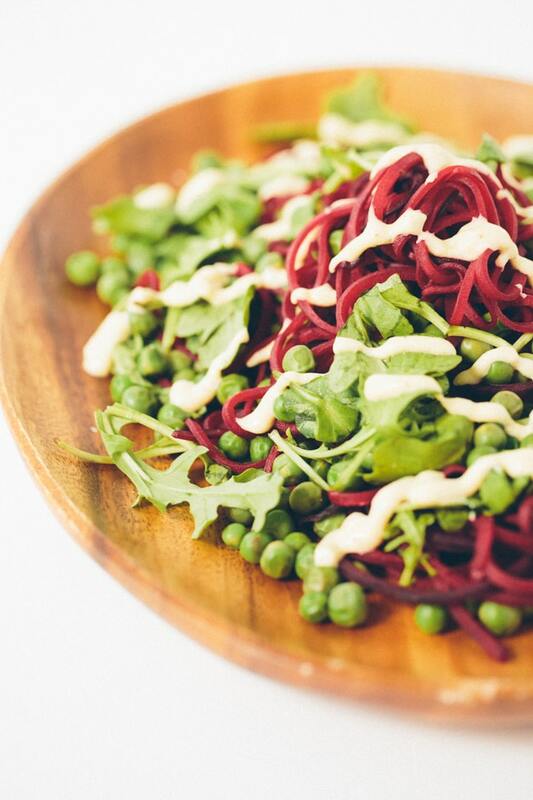 can I fry the beet noodles instead of roasting- our oven is down an out until we get a new one ! This sounds delicious! 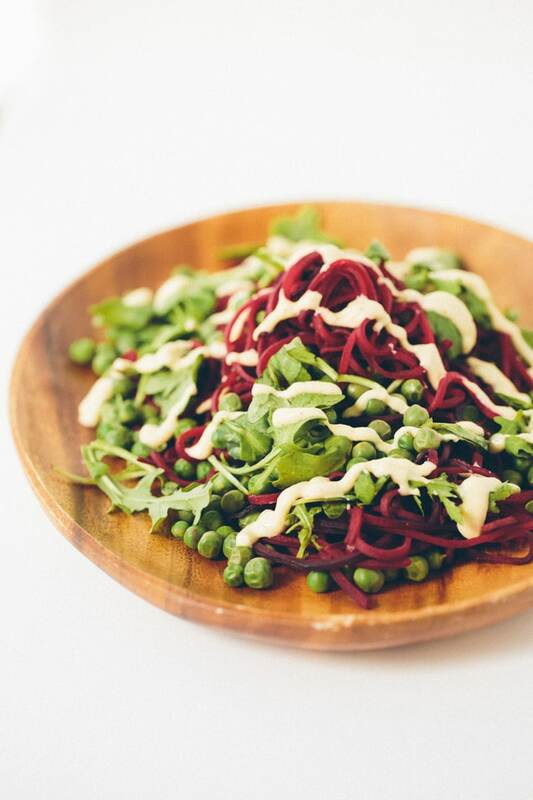 I've never thought to make beet noodles before! I second this request! I head to your cucumber sesame noodle recipe often just for that sauce. Made this for dinner tonight and served over Bib Lettuce instead of arugula. It was outstanding! Will definitely be making this again! Thanks!! We made this tonight and it was OUUUUT-standing! The flavors are just awesome. We grilled a simple piece of chicken breast and sliced it up for a small side. Can't wait to have it again with tilapia! Thank you for another great one. This salad was so delicious! Great job! Oh I really really have to try this one! The nutritional information is very helpful also.